Precast Concrete - What is precast concrete? The main difference between precast concrete and cast-in-situ concrete is that the former is a factory made product while the latter is prepared at site of work. It is possible to prepare well made precast products by keeping a high standard of finishing. 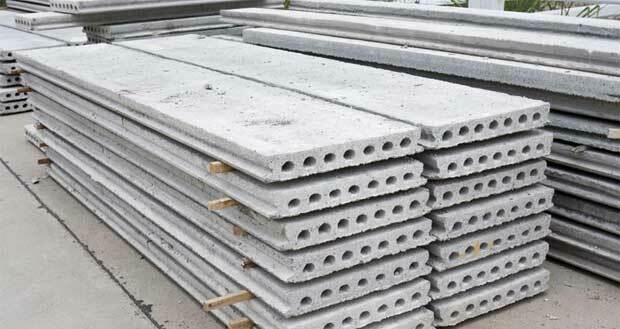 The precast products vary from simple structures such as fencing posts, pipes, paving slabs, etc. to elaborate and complicated artificial concrete blocks. The moulds, which may be of timber, steel or sand, are prepared to the shape of the product. The reinforcement, if any, is put up in the moulds as per design. The concrete is mixed in the desired proportion and placed in the moulds. The finishing of the products is then carried out. The ordinary products such as fence-posts, sleepers, etc. are left as they are, while products such as spun pipes are finished during the process of manufacturing. The products are then dispatched for use at site of work. They may be lifted and placed in position by means of light overhead cranes and small mobile cranes. The labour required in the manufacturing process of the precast units can easily be trained. The moulds employed for preparing the precast units are of steel with exact dimensions in all directions. These moulds are more durable and they can be used several times. The precast articles may be given the desired shape and finish with accuracy. The precast structures can be dismantled, when required and they can be suitably used elsewhere. The transport and storage of various components of concrete for cast-in-situ work are eliminated when precast members are adopted. The work can be completed in a short time, when precast units are adopted. If not properly handled, the precast units may be damaged during transport. It becomes difficult to produce satisfactory connections between the precast members. It is necessary to arrange for special equipment for lifting and moving the precast units. The economy achieved in such construction is partially balanced by the amount to be spent in transport and handling of precast members. Therefore, it becomes necessary to locate the factory at such a place that transport and handling charges are brought down to the minimum possible extent.